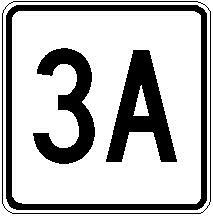 Massachusetts State Route 3A is a north-south highway in Eastern Massachusetts. It runs in two sections. The southern section runs from Plymouth to Boston. A section north of Interstaet 95 runs from Burlington to the Massachusetts/New Hampshire State Line. Info on MA St Rt 3A is broken down by county below.